It didn't take long before I had the grill opened and being used (yes I know it was a Christmas present, but I couldn't wait that long.) We started using the grill at tailgate parties before the BYU football games and it worked great. It was small enough to easily fit in the trunk of my car yet provided enough cooking area to feed the tailgate group. Because I was using it for the football games for tailgating all of the equipment was already in my car. This led me to a great idea. I usually bring a prepared lunch from home to work each day (well except Wednesday) so I figured why not tailgate at work by myself instead. 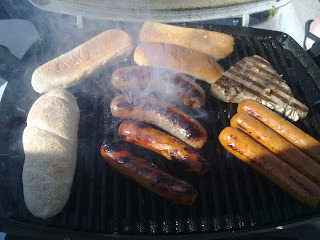 It was just as easy to have a package of Brats and cook them up as it was to make a lunch in the morning. What started as grilling lunch for myself ended up being an open invite every Tuesday with those in my office. The group got large enough that we had to bring in a second grill to cook all of the food. 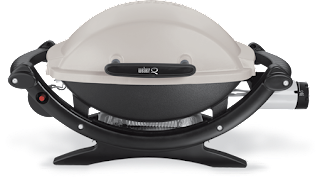 Now that its been pretty cold here and the Holidays are among us we haven't had the chance to grill for lunch, but once the weather clears up we will be back outside cooking up our own food for lunch again.